Ha ha. Look. XD I got the page up. And it has a giant reveal! I really can’t wait to see what happens next. Oh, this is going to be interesting… Where’s your Lackey when you need him, eh, Mordred? Also, I can’t seem to see today’s strip from the main page. I had to click on “Comments” to see it. Don’t know if I’m the only one, but I thought I’d let you know. …Honestly if I became one of those self same artifacts I think I’d REALLY want to know WHY then… Hee. ^_^ Mordred’s Daddy! Heh Awesome! Hopefully Mordred is saved. The world revolves around favors. Even in comics. OMG, OMG… so wait.. the phone’s an artifact? Shouldn’t Wiglafs dad have a character page by now? Calling it- next arcs going to be bout how every single character we’ve seen so far except Wiglaf secretly has an artifact. Wouldn’t it be a dozy if Wiggy’s chainmail turns out to be an artifact as well, but just some really lazy one who doesn’t ever go out in ghost mode, nor communicate. Hm. I wonder if Bliss will pop up. Also an odd curio point: Camlann nicked the orb, but I can’t see the crack on the orb since them. Has it repaired itself, or just its hard to see? After all, Bliss likes to look pretty. A crack is not pretty, by her definition. So. Malachi is an artifact? And one that can change its form (Grace slowly has, so I’m not surprised Malachi did). I don’t think any of them can change their form. Grace doesn’t. I think it was a conversation between Azreal and Security, but it was mentioned that Grace’s flower hilt changes. And could it be that Malachi is transporting through the phone? Or maybe Malachi’s Artifact allows through phone travel? HOLY CRAP CELL PHONE ARTIFACT! Wait…cell phone? All the others are fairly standard older pieces, but a cell phone? You’ve got swords, orbs, rings, but a cell phone. That I did not see coming. At least Wilhelm has a reasonable way of hiding his talking to his artifact. 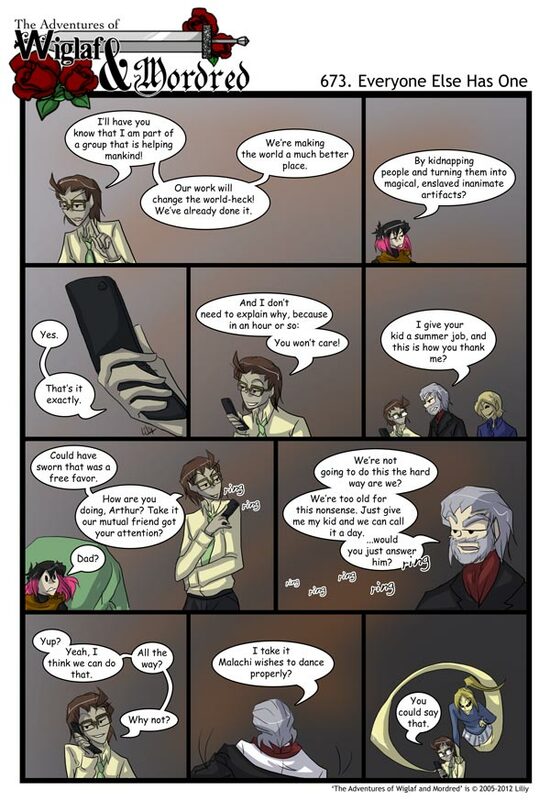 The others look crazy, but with a cell phone, you seem like you’re…well, on the phone. Where’s the “dun-dun-DUN” sounds when you need them? I’m going to bet Malachi wasn’t an artefact until recently. That he’s a former member of the group, and got sick or something, so becoming an artefact became a preferable deal. So can he only talk to Vilhelm on the phone or is it truly a cover for his talking to his artifact. And does the ‘phone’ work like a normal phone?